A cheque of more than £11,000 raised by church congregations across north east and mid Wales has been handed over to Alzheimer’s Society Cymru. A total of £11, 194.80, was donated for the Diocesan Offering, more than £2,000 higher than previously announced. One of the largest fund raisers was the staging of Moses the Pantomime, produced by 19 churches in Flintshire and showing over three weekends in Spring 2018. It raised more than £1,800 for the Alzheimer’s Society. More than £1,000 was raised by two cyclists from St Ethelwold’s Church in Shotton. The pair, Rob Dawson and Debbie Ellson, cycled over 200 miles from the church to the Shine of our Lady of Walsingham in Norfolk, in under 24 hours. 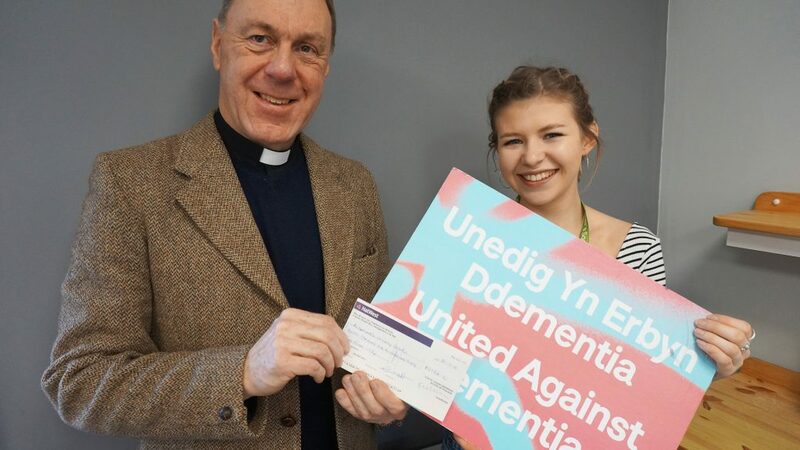 The community fundraiser for Alzheimer’s Society Cymru, Helen Marchnant, collected the cheque from the Dean of St Asaph Cathedral, the Very Reverend Nigel Williams, last week. She said: “This is a substantial donation which will make a big difference to the services we can provide across the region. “We are so grateful to all the churches who contributed to this donation. But it’s not just about money. The profile given to us through this fund raising initiative, means more people are making contact, both wanting to access our services but also wanting to organise their own fundraising. More than 45,000 people in Wales are living with dementia and there are many more who don’t have a diagnosis. Alzheimer’s Society Cymru offers support to people with dementia and their families. Every year churches in the Diocese of St Asaph select a local charity to support, in addition to other fundraising. Previous recipients include Tŷ Croeso at Ysbyty Glan Clwyd, Blind Veterans UK, Wales Air Ambulance and Farming Community Network.